Let's do a little macro/micro exercise. We'll start by zooming in on the average employee. He's there at his desk, printing out an important spreadsheet or the annual report, along with a cute sign for the break-room or his buddy's band poster—maybe even doing it in color. Toner and paper are a natural part of his workday routine. Sometimes they run out—but then they're replenished as if by magic (by the diligent office manager). So he doesn’t think about how much he’s using. Now let's skip ahead to the next day, when he does the same thing again. And the next. And the next. All to the tune of $1,000 in consumables per year on average. When you start to zoom out, multiplying that by the number of employees in your entire organization, it quickly becomes apparent that the cost of print consumables in enterprise printing is anything but trivial. It's actually a significant expense. Auditing is a great way to get a grip on the runaway costs of consumables, but traditional print management solutions don't provide any useful reporting tools that give you both the comprehensive and granular data you need to audit effectively. Native Windows print services don't provide any auditing and reporting features at all. On top of that, you have the hefty upfront costs of print servers (see our previous post on reducing print server infrastructure) and the time your staff spends answering print-related service desk calls (see our previous post on reducing these costs, too). Fortunately, PrinterLogic printer management software allows you to reduce or even avoid these costs while giving you powerful auditing and reporting tools to monitor usage of consumables at the same time. Even though every print job is sent directly to a physical printer, the client on each workstation sends relevant metadata to the admin. That data is then collected and presented in a way that enables you to view all print job statistics in a clearly understandable format that can also be exported for further analysis and shared. With PrinterLogic, you'll be able to easily keep an eye on things like the number of pages being printed in a particular department, your company's top 100 printer users, and employees who frequently initiate large printing jobs. This link has a few more examples of all the parameters you can monitor at a glance. 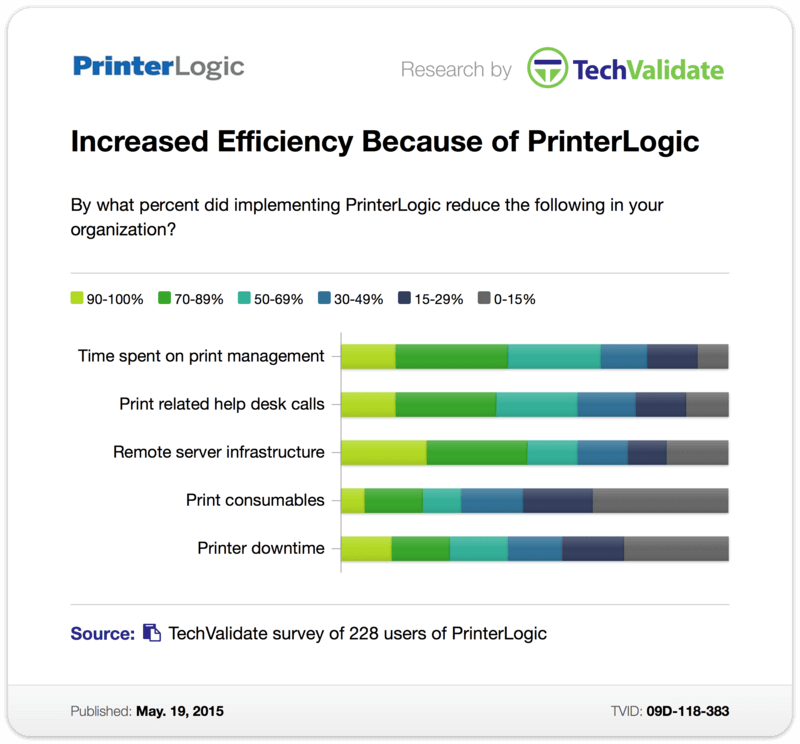 Such proven auditing tools might not be the primary reason why our customers make PrinterLogic their enterprise printing solution of choice, but you can be sure that more and more of them are finding these tools indispensable.